This post is courtesy of our contributor Chantelle…My absolute favorite Christmas special is the stop animation version of Rudolph the Red Nosed Reindeer. 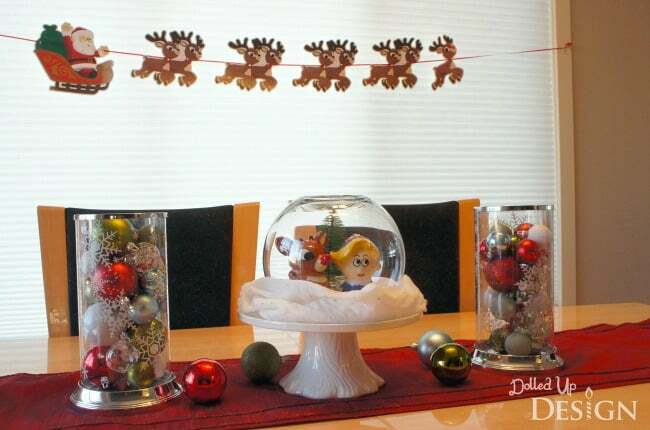 I have many fond Christmas memories watching this classic Christmas tale, so in celebration of their 50th anniversary this year I decided to design a fun Rudolph banner to help deck our halls. Over the years I have amassed many Rudolph Christmas decorations, including a small tree full of ornaments and an entire Christmas village inspired by the movie. I have elements of Rudolph throughout our main floor and am excited to have my custom designed banner strung up as the finishing touch. To create your banner, simply print off the 3 page file in color on tabloid sized paper (11”x17”). I printed mine through a copy center and chose 100lb cover stock as my paper option. 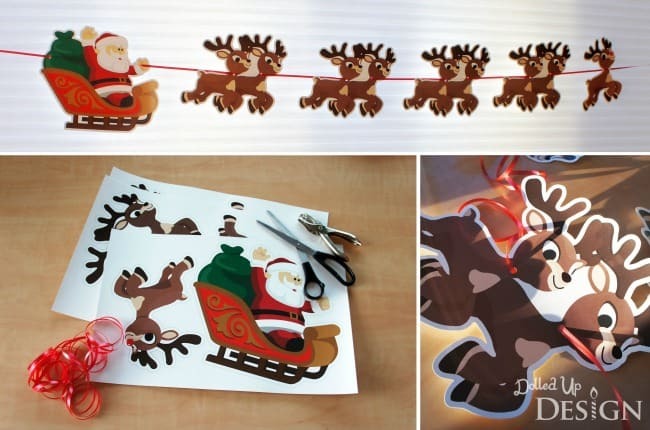 Cut out each of the figures with sharp scissors. Punch holes through each of the figures where indicated and feed ribbon through each. You might notice my version has the holes at the reindeer’s necks, but this left my banner off balance and I had to glue weights to their feet to straighten them out. Punching holes through the antlers as shown on the file should remedy this issue. Hang the banner in your desired location. I used 3M Command Strip hooks to string mine across our dining nook window. I have strung my banner across the window, but it would also work well on the mantle or just flying across the wall at home or in a classroom. 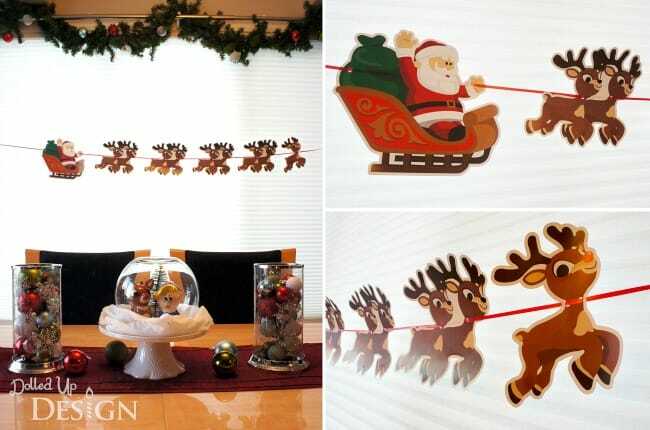 To save on space and cutting time, you could even just print the first page of the document and have Rudolph solely guiding Santa’s sleigh. We’d like to send a huge THANK YOU to Chantelle for sharing this free printable with us. There are a lot more where this came from – visit her on Facebook to see the latest ideas for fun crafts, party ideas and more! 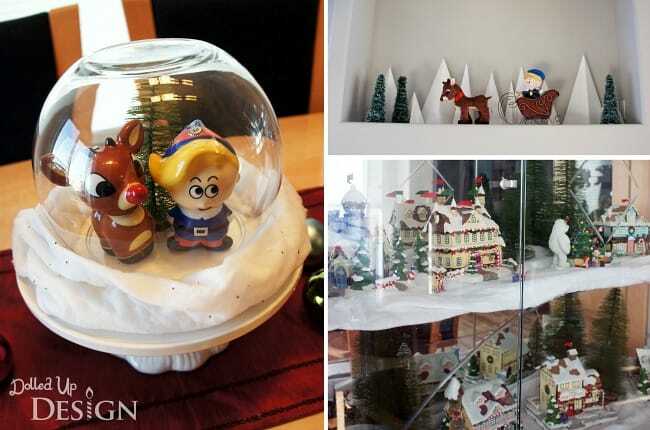 For even more fun ideas for Christmas, visit our Christmas Fun page. We have things like free printable games, party ideas, snack ideas and more. 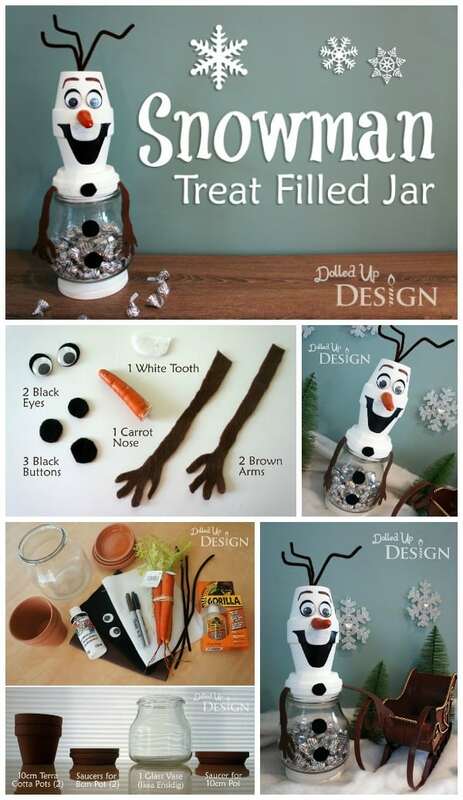 Don’t miss Chantelle’s Olaf Jar craft – one of the most popular Christmas posts here on Moms & Munchkins! This is so adorable, Chantelle! Hi! Thank you for letting us know! We’ve uploaded a new Rudolph banner document & it seems to be working now if you’d like to try again. Thanks & Happy Holidays! This is absolutely adorable! Printing out a set for myself and sharing. Thanks!! 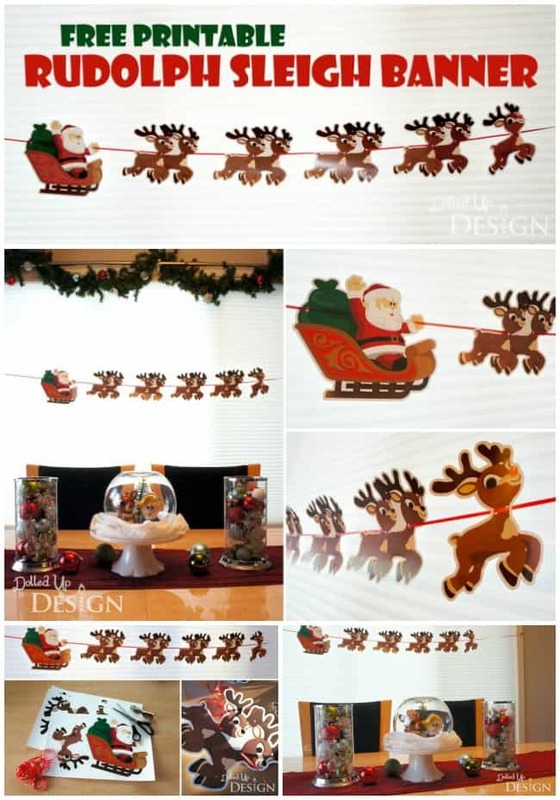 Hi… i really like ur ideas and really want to print the rudolph banner. The pdf uploads doesn’t work. It just appears black…please help me…I already try it for 5 times. It is a large file so, depending on your computer’s speed, you may need to give it a few minutes to load. It is a PDF file. I tried the direct link and it is still loading completely black. Hi Victoria! We’ve changed the size of the file so it should be easier to open. Please let me know if you have any additional troubles! I am having the same problem that was previously mentioned in that it is only loading completely black for me as well. 🙁 It is ADORABLE though so I’m hoping at some point I will be able to print it out. Thank you for sharing!! Hi Tish! We’ve changed the size of the file so it should be easier to open. Please let me know if you have any additional troubles!